← CONvergence 2016: Guest(s) of Hono(u)r! A couple of reviews of mine have gone up on NPR Books recently! Here are snippets from them. 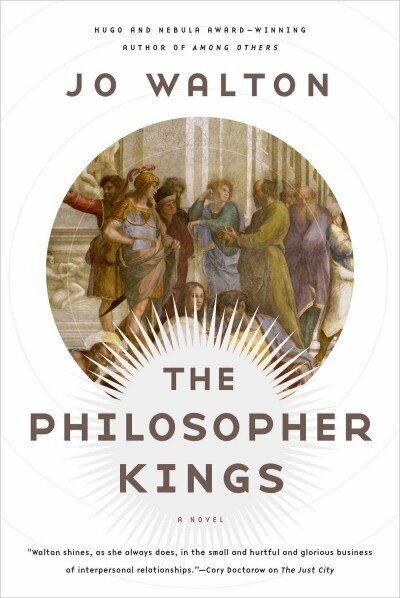 First, Jo Walton’s The Philosopher Kings, the second book in her Thessaly sequence, following The Just City. … only to hear Walton cackling, Trollope-like, at my devastation in finding that The Philosopher Kings is set THIRTY YEARS LATER. 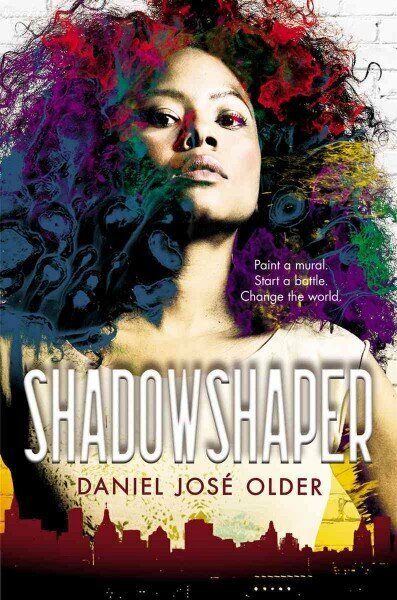 Second, Daniel José Older’s Shadowshaper, a gorgeous YA novel featuring characters I wanted to befriend. What struck me throughout this book was the beautiful, nuanced, supportive and loving nature of Sierra’s community. Made up of her friends, her family, her extended family’s friends, her neighbors, there’s tremendous joy in their every interaction: The banter, the support, the kindness threaded through merciless teasing. There’s conflict too, of course, but that bedrock of love and affection is always there — and it’s utterly nourishing to see such a gorgeous, diverse mix of characters from different backgrounds frankly discussing their histories and futures. Sierra’s own movement through her family secrets is very effective, and the decisions she makes — of what to embrace in herself, from her nappy hair to her magical abilities — are powerfully moving. 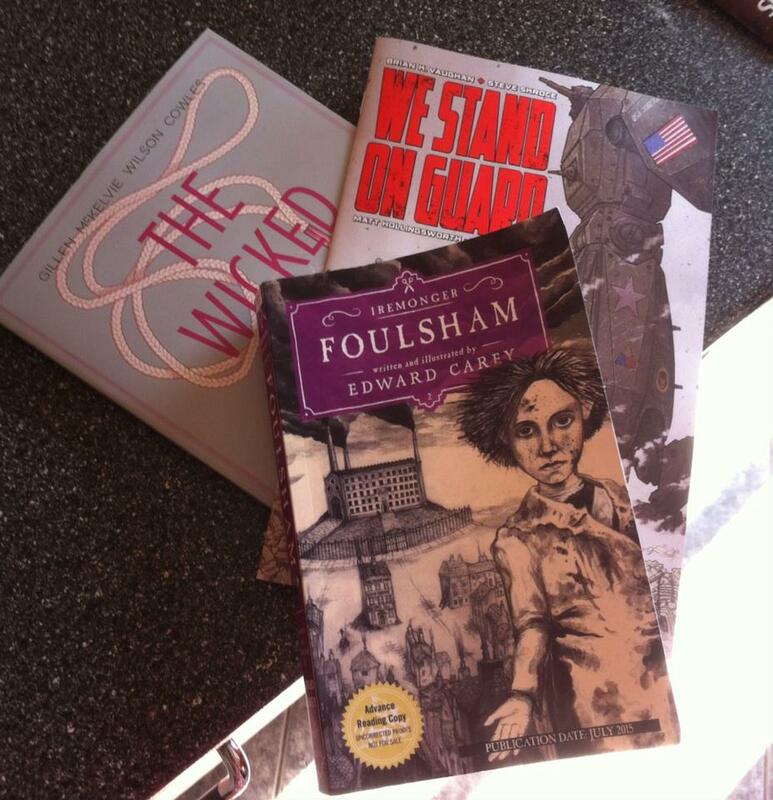 Presently I’m reading Edward Carey’s Foulsham, the sequel to his incredible Heap House, which was one of my top three books from last year. Foulsham thus far is fully as good and I find myself resenting time I have to spend away from it. It’s coming out in a few days, and so will my review. Likewise featured in photo: things I won’t review for NPR but that I have thoughts about for later. Briefly, The Wicked + the Divine vol. 2 is AMAZING, significantly better than the first, which was certainly no slouch; We Stand On Guard #1 I am still sorting complicated feelings about, but will keep reading. CBC reviewed it, though! So that’s me for now — what are you all reading? This entry was posted in Uncategorized and tagged brian k vaughan, daniel josé older, jamie mckelvie, jo walton, kieron gillen, npr, reading, review, steve skroce, We Stand on Guard, WicDiv. Bookmark the permalink. I just gave Interzone a review of the Vandermeers’ anthology of feminist short stories, Sisters of the Revolution. Fascinating collection, very varied, with some beautiful stories – Sur, Ursula Le Guin’s tale of a group of South American women going to the South Pole before the men do, but not telling anyone because it would just upset everybody – and also some deeply angry and quite upsetting stories of violence and abuse. Disappointed in the collection’s treatment of trans people though, every story that featured them was negative or dismissive. I know this was the position of feminism in the eighties and nineties, and it’s valid to have those stories there, but the conversation has moved on and the modern position is missing. Right now I’ve just finished Charlie Stross’s The Armageddon Score, which is a very British take on superheroes, and features three great women as the lead characters. I’m halfway through The Gracekeepers by Kirsty Logan, which is just beautiful, and I recommend to you as a book I think you’ll like. If necessary I’ll buy you a copy. And I have Amanda Downum’s Dreams, Shreds and Tatters, Emmi Itaranta’s Memory of Water, and Mary Rickert’s The Memory Garden queued up to follow. Looking forward to Aliette de Bodard’s House of Shattered Wings coming out in August.